Premananda Panda (1950-2015), an Indian author of Odia and English with a poetry collection in Odia— Sidi (meaning ladder, 2001) and a collection of English short stories— Across the Blue Horizons (ed. 2008); and editor of Replica (a popular magazine of English language and literature, started in 1997) breathed his last on 30th May 2015 due to severe heart attack at Sun Hospital, Cuttack, Odisha. A man of benign nature and helping attitude Mr Panda was born on 17th Feb 1950 at Parahat, a village in the District of Jagatsinghpur, Odisha. Late Baikuntha Panda was his father and Late Keluni Devi was his mother. He left two daughters— Mrs Prajna Panda and Mrs Priti Panda and one son— Malaya Manas Panda along with his courteous wife— Manjuprava Mishra. He did his M.A. in English in 1972 from Ravenshaw College, Cuttack. 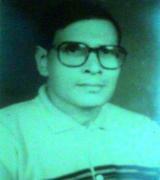 He started his career as a Lecturer in English at S.V.M College, Jagatsinghpur in 1976. After that he joined Salepur College as HOD- English in 1991, Kendrapada College as Reader in English in 2003 and Kishore Nagar College (Cuttack) as Principal in 2008 and worked there till his retirement in 2010. He was felicitated as a poet in World Poetry Day Celebration in Gangtok, capital of Sikkim State, India from Government of Sikkim in the year of 2006. Besides ‘Radha Krishnan Gold Medal Award’ (given posthumously) on the occasion of Teachers Day dated 5th September 2016 from Global Economic Progress & Research Association, Chennai, Tamilnadu, he was also conferred with ‘Sahakar Award’(Cuttack, 1999), ‘Kalinga Sahitya Academy Samman’(Salepur, 2001), ‘Kendrapada Sahitya Sansad Samman’(Kendrapada, 2002), ‘Jagatsinghpur Sahitya Sansad Samman’(Jagatsinghpur, 2005), ‘Loving Sisters Award’ (Jagatsinghpur, 2002), ‘Guru Gaurav Samman’ (Cuttak, 2007), etc. from different literary and socio-cultural organizations of Indian territory. After retirement, he was preparing a poetry collection in English— a big dream of his life, which may come true in near future.